PLUS SIZE FASHION: ERZULLIE TURNS 6! Erzullie is turning 6 today. The brand has survived more than half a decade already. What can I say? Usually, every year, we do something nice or crazy or BOTH. First year, we had an amazing fashion show. 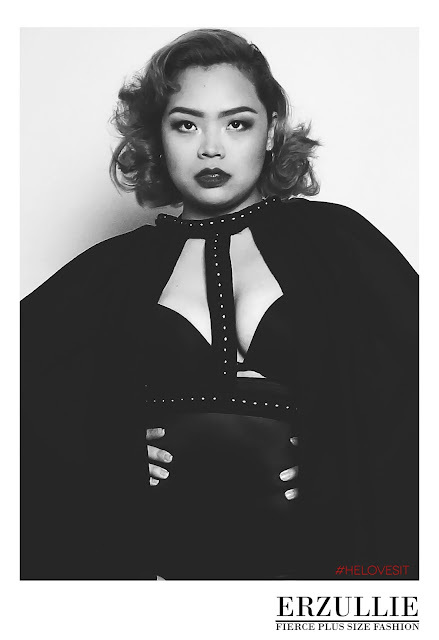 Second year, we had a plus size editorial. Third year, another fashion editorial. 4th year is the same but with a lot of activities. 5th year we went on a hiatus as we have suffered some burn out. And now, this year we came back with a whole new approach. Things have definitely changed --- yet again --- for Erzullie. We became a bit more low-key and private. We focused more on quality than quantity and definitely more on building connections with you ladies than chasing the popularity ratings on google like we used to. We are grateful for all the Erzulliestas that remained with us all through this year and we are grateful for the new ones that just added to our number of women. I am always glad to see our number of fierce plus size women grow. And surprisingly, you ladies have been showering us with more support than ever. I am actually a bit surprised. This year we did plus size model open shoots and workshops. We did more open style houses and first look events. We had our last The Fashion Feast event as we shed our mass produced methods and focus more on demi-couture. We have launched a successful #HELOVESIT campaign, focusing on the fact that there are men out there who are looking for fierce plus size women. I am glad that a lot of the Erzulliestas came out with their stories on how they have found their lover or how they were able to find love for themselves. It was a definite new change of direction for us and we are glad that we went through what we went through. And well, we are looking forward to more things to do with Erzullie. I know that she can give more. I just need to give her and the whole Universe some time to give me the right idea so that I can move past on this one. Let’s do this, Erzulliestas. Keep the fierce! Take your pick. Enjoy, ladies!